Just the words from “I’m All Smiles” sets the mood for romance but add to that Dianne Reeves passionately singing and scatting this tune and it raises the romance to another level. This is my favorite track from her new Blue Note release, A Little Moonlight, which contains 10 songs drenched in love. Dianne brings warmth, beauty, and grace to each lush note of these classic gems. I first heard the opening track “Loads of Love” on an early Shirley Horn album. “I want my dinner, some smart conversation, and loads of lovely love.” Now those are words to live by and Dianne delivers them quite well. Her fervent reading of “I Concentrate on You” has a bossa nova flavor. She is full of wise on “Reflections”as she poignantly reflects on her life and the lessons she has learned along the way. She calls on the “Skylark” to lead her heart to the love it has lost. Her beautiful phrasing tugs at your heart. She brings the tempo up and scats in her playful rendition of the title track, “What A Little Moonlight Can Do” and then simmers down with “Darn That Dream” which features Romero Lubambo on solo acoustic guitar caressing her every note. He also joins her on the sweet “Lullaby of Broadway.” She lovingly smolders on the wistful “You Go to My Head” as trumpeter Nicholas Payton adds just the right touches to this romantic melody. She closes out with a promise to return on “We’ll Be Together Again” and that is enough to keep us enchanted forever. Carefully crafting their notes and rhythms to accompany to her to perfection are Peter Martin on piano, Reuben Rogers on bass, and Gregory Hutchinson on drums. I have had the pleasure of seeing Dianne Reeves three times in concert but this night was extra special. The lights were low, the mood was just right, romance was in the air, and the couples were cozy as Dianne looked radiant and crooned majestically throughout the evening. She opened with the “12th of Never” and moved to her scatting tribute to Sarah Vaughan, “I Remember Sarah” which featured some great rhythms from her drummer, Gregory Hutchinson. She scatted note for note with pianist Peter Martin on this wonderful tune. Dianne used a Joan Armatrading song line to describe her new album, A Little Moonlight. “I’m not in love, but I am open to persuasion.” She continued to woo us with a lush, warm, passionate rendition of “Skylark.” The acoustics were perfect so every note was clear and crisp. She held you on the edge of your seat with every word. I heard the opening bass notes from Reuben Rogers on “I’m All Smiles” and I thought I would either melt or elevate from her playful, magnificent delivery of this song. Dianne shared childhood stories of her singing songs that did not know the meaning of at family gatherings and how the adults would just laugh in enjoyment. Accompanied by a down home, bluesy solo piano, she took us back to the early days with “I’ve Got Rock In My Bed” where she told us of having the “blues from roof to ground” and a naughty little twist on the end where she sang “I’ve got Rocks Johnson in my bed” which indicates she may have found a cure for those old blues. She reflected a bit more on childhood with the jazzy, breezy “I Remember Nine” and made us starry-eyed once again as she sang the first couple of verses of “You Go To My Head” acappella. It was definitely a highlight of the evening. “Blue Prelude” opened with Reuben’s bass solo and Dianne gave a serious moan on the end of the song. She closed with “Show Me Your Heart” filled with chants and Latin rhythms. As she bid us goodnight, she reminded us to “tell our stories.” I felt so good after the concert that I had to sit there for a few minutes, as the crowd cleared, just to soak it all in and reflect on this powerful musical experience. Thank you Dianne! This entry was posted on Thursday, November 13th, 2003 at 8:29 am. 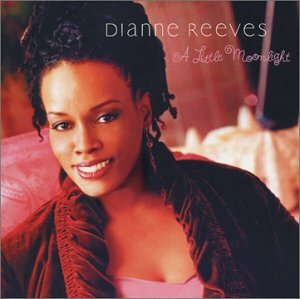 It is filed under Music Reviews and tagged with A Little Moonlight, Dianne Reeves, jazz, vocals. You can follow any responses to this entry through the RSS 2.0 feed. nice write up and dianne reeves she’s a great aristist. I’ve never recovered from “Company,” from her “Never Too Far” album. Gah. Ha!!! This is one you won’t get me rushing out to buy… nope, not at all… *sigh* ok, I bought it weeks ago. Dianne dominates my music collection. I’m not a big Dianne Reeves fan, but I enjoy your blog overall. Ohhh, you’re right…that was such a wonderful show!